Obesity is a global epidemic. It is estimated that over 50% of pregnant woman in the United States are overweight or obese. Compared to normal weight patients, an obese patient is more prone to a number of complications during pregnancy and delivery including higher rates of cesarean section. And with c-sections, comes the administration of epidurals. Epidural catheter placement in bariatric patients can be more challenging because the spine can be harder to find and pinpoint where the puncture needs to be placed. "Because it's difficult to get in, in the first place, it's not exactly in the right spot and if it's not in the right spot the function tends to be poor," says Dr. Victoria Eley, an anesthetist working at the Royal Brisbane and Women's Hospital. Because epidural complications and challenges are more common in overweight patients, it is especially important for doctors to position these patients in the most precise way they can to achieve a positive outcome. PHS Medical's EPD (Epidural Positioning Device) was designed to do just that and help reduce some potential epidural placement risks. 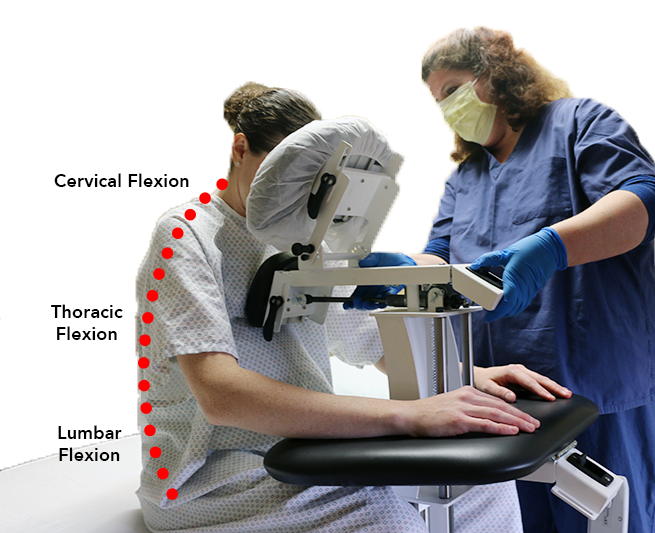 The EPD and E-EPD correctly and comfortably position patients up to 600 pounds to receive an epidural by encouraging cervical, thoracic and lumbar flexion while maintaining a solid and stable position. EPDs provide doctors with a safer and more efficient way to help patients receive a successful epidural by allowing optimal body mechanics to be achieved through the controlled device. It has been found to be very helpful in assisting doctors and medical staff with overweight patients by improving patient comfort needs and outcomes and reducing inefficiencies and stress on both the patient and the medical staff. Obese and overweight patients can be harder to move, position correctly and hold steady for the administration of the epidural. The hassle-free EPD can eliminate these issues because it can be brought right to the patient and adjusted according to their height and size. The weight of the patient can be transferred to the locked EPDs rather than onto the assistant, nurse or unsteady pillow, which can cause stress, unstable positioning and failed epidurals. The EPD and E-EPD were designed to improve overall safety and reduce risks associated with epidural placements in an effective and efficient way. It is a great solution for making an already difficult process a little less difficult, especially in overweight or obese patients.